NCIS: Los Angeles cast members Eric Christian Olsen, LL Cool J, Chris O’Donnell, Linda Hunt, Daniela Ruah and Barrett Foa signed four DVD’s from The Second Season DVD (6 disc set) to be auctioned off for Hats Off For Cancer. 100% of the winning bid will go to helping kids and teens with cancer. We even received them (hand-delivered) from our celebrity spokesperson (and NCIS cast member), Eric Christian Olsen. Bidding ends on Friday, November 23rd, so bid soon and bid often to help kids and teens battling cancer. Click here to see the listing and bid! Eric Christian Olsen hand delivers signed NCIS: Los Angeles DVD’s and hats to Hats Off For Cancer! Big thanks to Social Entrepreneurship and Change students at Pepperdine University for collecting hats in class! As a group of movers and shakers, sometimes sitting in the classroom is a tough necessity for students in the Social Entrepreneurship and Change program at Pepperdine. Being cooped up for multiple days in a learning environment is simultaneously invigorating and frustrating. We want to learn, but we also want to go and do. That’s why, in the true spirit of entrepreneurship, Cohort 3 decided it would be Good to Give…something tangible we could do at each Face to Face Session to contribute to a cause (the go and do!) while we are in class (the sitting and learning!) Good to Give (or G2G as it’s affectionately known) is an in-kind donation program where SEC students collectively combine their resources to make a small dent on a societal issue. Nominate them as our HOC Hero of the Week and we will feature them on our blog and web site with a link to their personal story and fundraising page! Send a short (200 words or less) note about your Hero along with a photo to hatsoffforcancer@gmail.com by Friday at 5 p.m. each week and we will highlight a new Hero each Monday morning. Alvernia University Athletics – Toss Your Lids for the Kids! On Tuesday, February 14, Alvernia University will join Girl Scout Troop 1790 and several other sponsors to collect new hats for Hats Off for Cancer. 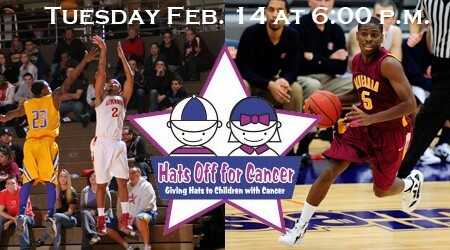 Alvernia and the sponsors of this event encourage each fan in attendance to bring one brand new hat to be donated. The hats will be thrown onto the basketball court during halftime of the Men’s Basketball game versus Messiah that starts at 6 p.m.
Alvernia University Athletics – Toss Your Lids for the Kids!. As 2011 comes to a close, consider making a year-end donation to Hats Off For Cancer. Children are fighting cancer every day. Help us make those days brighter by contributing to their happiness and improving their quality of life through a donation as this year ends. Your money goes directly to shipping, purchasing and storing the hats that are distributed to childhood cancer patients around the world. We thank you, but more importantly, these children thank you! Donate here. All donations are tax-deductible. Hats Off For Cancer is recognized by the IRS as a 501 (c) 3 nonprofit organization.